Recap: GHSP Trail Days Success! 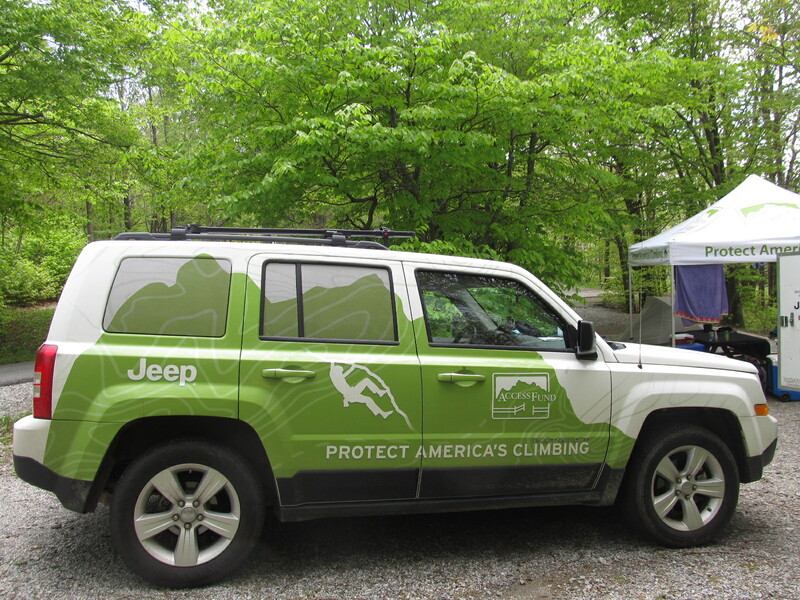 The Grayson Highlands Trail Days Event was an enormous success. 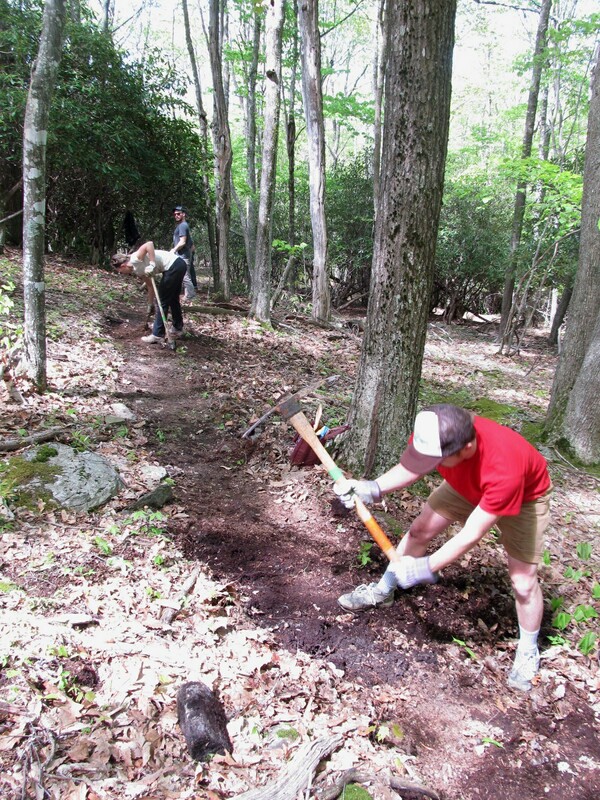 In two days, over 40 volunteers with the collective efforts of the Access Fund Jeep Conservation Trail Crew, VA State Parks, GHSP State Parks, and AmeriCorps, came together to construct a brand new, 1.3 mile loop, VA State Park boulder and hiking trail called the Split Rock. The Access Fund Trail Team arrived Wednesday night, the 22nd of May, and set up camp as a powerful storm front moved in (Claire Wagstaff was nearly carried away “Mary Poppins style” as she held onto the Access Fund Tent to prevent it from being blown away). Ty Tyler, the Stewardship Manager of the Access Fund, arrived the next morning and the weather continued to be uncooperative, although we all were able to hash out plans and scope out the project site. 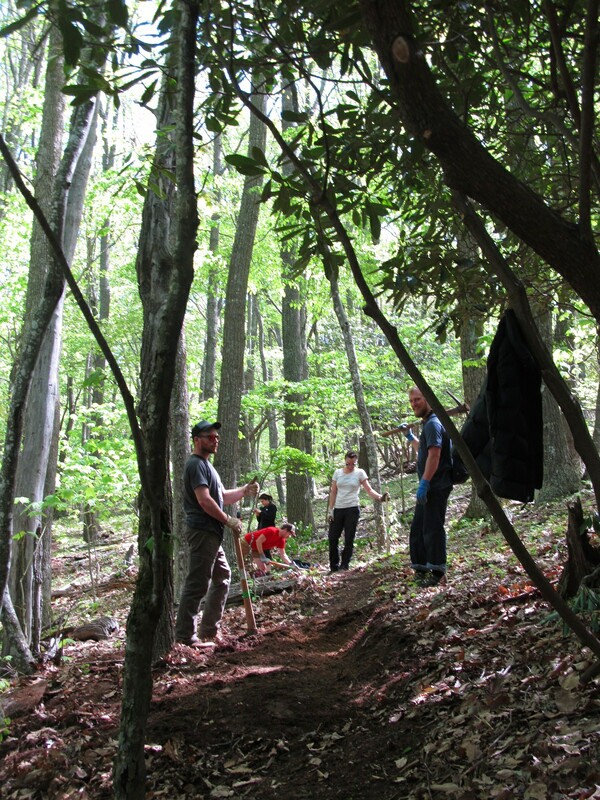 Eventually the weather broke and the Trail Team unleashed their trail building superpowers and set up the area for the high octane volunteer effort that was about to happen. The afternoon of the 24th, after the trail prep, Eddie Wooldridge, Ty Tyler, and I decided that after two days of solid rain, thunderstorms, and an afternoon of chain sawing and trail work (myself not included in the hard work portion) some bouldering was of high priority as the rock had finally dried off. Ty and I managed to climb the “Highland Highball” in the Highlands Area before getting soaked to the core and chased off of the mountain by heavy rain, hail, high winds, thunder, and lightning. Eddie used better judgment and turned around at the trailhead before heading up to meet us. On the morning of the 25th weather was picturesque and the temperature was crisp. Volunteers started showing up and at 10:00, with most of the folks warmed up after a collaborative effort to unstick a stuck Subaru from the campsite field, we headed toward the trail area tools-in-hand. Until 2:00 we all chopped, dug, and drug the line and roughed in the entire trail that day. Afterward, we broke for food and an evening of GHSP bouldering until 8:00 where the bluegrass band, Redleg Husky, was scheduled to play. 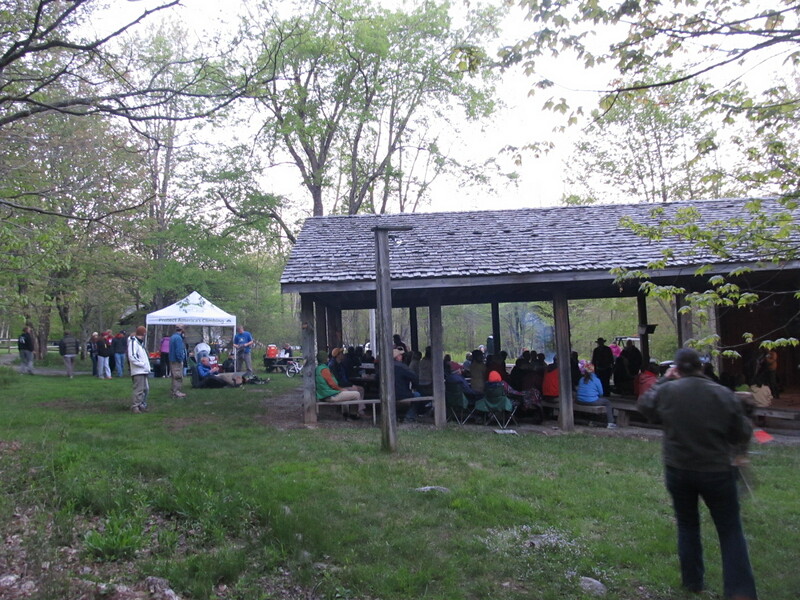 At the bluegrass show, all volunteers and over 70 park visitors and campers came out to enjoy the music. Redleg Husky put on an amazing, energetic show, only stopping for a break when we held the raffle. The raffle, with gear donated by HippyTree Surf & Stone, Giddy Organic, and the Access Fund (with a couple GHSP Guidebooks and Maps thrown into the mix), raised enough money for another GHSP rental crash pad! The show picked back up and played until 10 when quiet hours for the campground started. The following day at 10:00 we all got back out to the trail site to finish up. Even more climber volunteers came out that day to lend a hand. We needed to back slope several spots and to clean up much of the sections we had previously roughed in. The vast majority was completed before lunch, and afterward nearly the entire trail was constructed and in place. 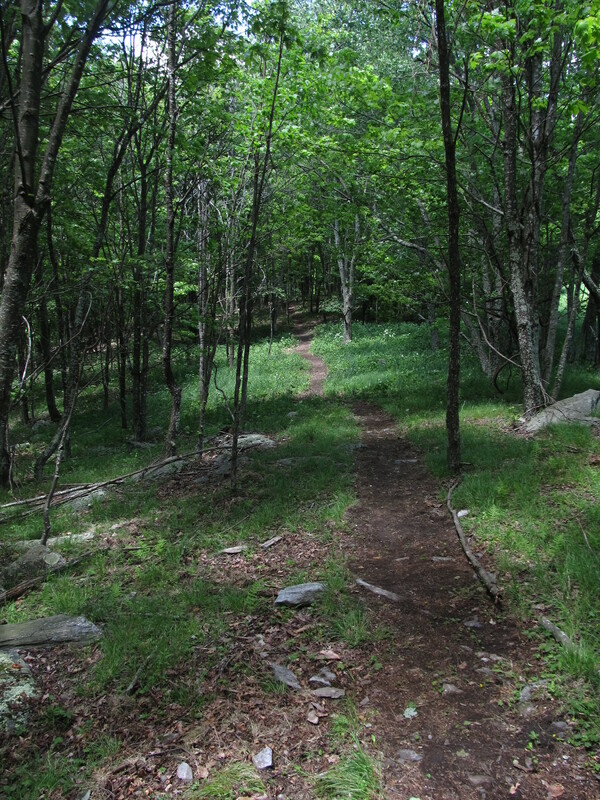 All that is left is to blaze the path and for a set of stone stairs to be constructed at the start of the trail. Another cool addition to the trail that the park wants to implement is interpretive signs (with boulder problem photos and descriptions alongside geological highlights of the rock) that I am now designing. A HUGE thanks to GHSP, the Access Fund folks, every single volunteer who came out and dedicated their Memorial Weekend to the event, Giddy, HippyTree, VA State Parks, and AmeriCorps for making this whole event possible and successful. 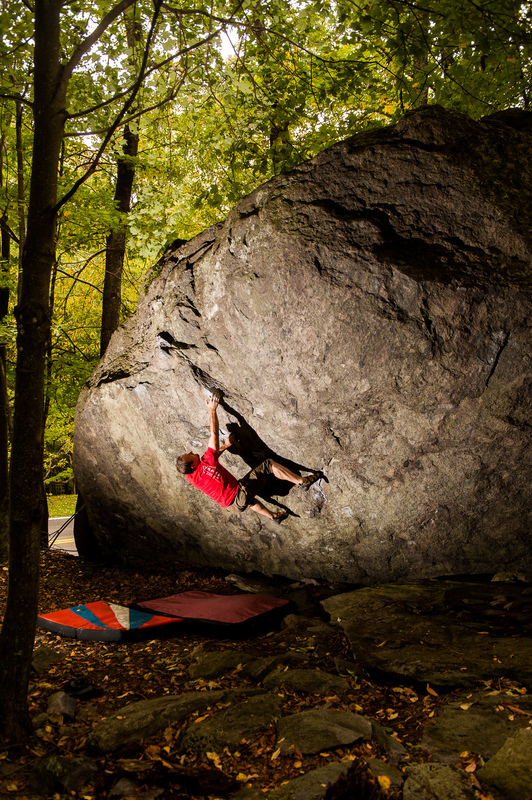 Grayson Highlands State Park now has its own state maintained 1.3 mile loop bouldering trail that was designed and built by climbers. That’s something not many State Parks can boast. This is a trail that will be around for years to come, and will be enjoyed by climbers and hikers alike. Be sure to come out and hike or climb along the Split Rock Trail next time you visit GHSP!